My dad and I were recently fishing at Reelfoot Lake, TN. We went to the Cypress Point Resort for a 4-day fishing trip. It was the first full week of May 2014. The winds were high and we had difficulty catching the crappie we wanted. Our plan each year is to eat many of our meals out of the lake… Fish we caught. With the lack of fish being caught in the form of crappie, we found ourselves in a small bay that was producing several catfish as well as freshwater drum (sheepshead). 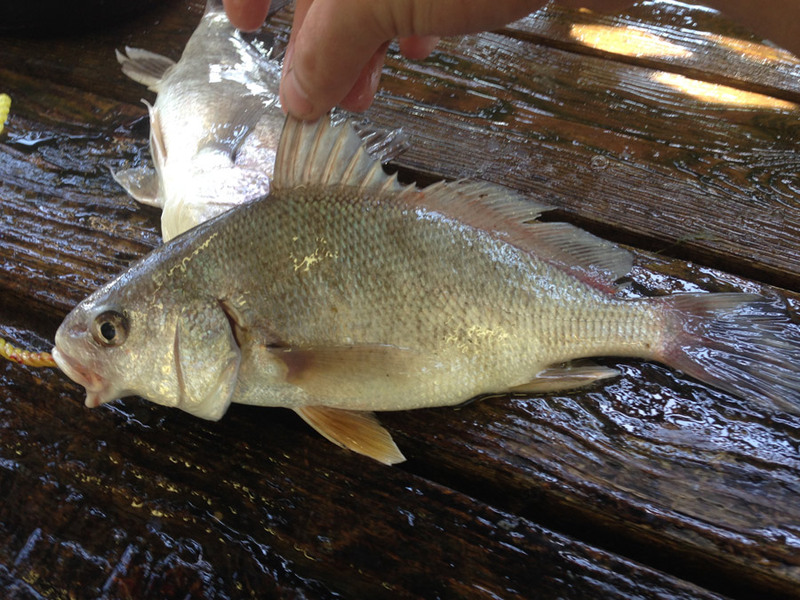 Some locals call the freshwater drum white perch. We had mixed feelings among people when we asked if anyone does any cooking and eating freshwater drum. Most of the attendants at the resort said, “some people eat it”. Due to the shortage of more conventional fish, we decided cooking and eating freshwater drum was worth a try. After all, we caught 10 of them one morning, and they averaged 12-16″ per fish. I selected 4 freshwater drum to prepare for lunch. We filleted the drum in the same manner as any panfish. The drum’s fillets are interesting in that the fish has little belly meat. The dorsal muscle on the freshwater drum is thick. It is the main part of the fillet, and the only real usable meat in a drum. I don’t have any knowledge of how the local may prepare their freshwater drum. 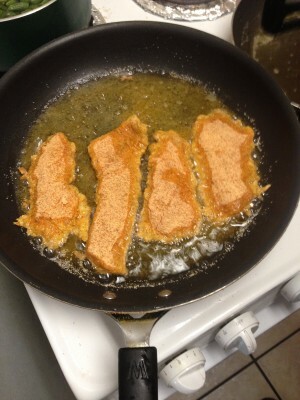 We breaded our freshwater drum in salt, pepper, and flour; egg; and Andy’s Fish Breading and pan fried it in Wesson oil. The smaller freshwater drum fried up completely fine. When we decided that cooking and eating freshwater drum was what we intended to do, it was not without apprehension due to conflicting stories of taste and quality. The small fillet from the drum was not a terrible texture or flavor. I did notice that is was a bit more oily than most fish, but not entirely inedible. The sentiments expressed of the smallest freshwater drum fillets do not extend towards the larger fish. When we cooked and ate the larger freshwater drum, the meat was very chewy. It, instead of flaking, broke apart in chunky pieces that brought me to the brink of vomiting. It was a very unpleasant fillet, and not one that I’ll eat again. This is a freshwater drum. Some people eat them. Do you? If so, how do you prepare it? I am from Texas, Beaumont, Texas to be exact. I have fished all my life. Growing up I caught fresh water drum often. We called them Gasper Goo. My mother said "Goo" was good baked, so when I caught one, or two, that was how she would prepare it, baked with a bit of butter and seasoned with black pepper and salt. It was not until I moved to Louisiana that I learned how to cook "Goo". It is really good in a tomatoe sauce. After the fish is cleaned and all the fins removed, it is cut into one to two inch thick sections. The fish is seasoned with salt, red and black pepper, garlic salt, onion salt, and Tabasco or Louisiana Hot Sauce. Then a large yellow onion, or two small white onions, are chopped course, A bell pepper, a stake of cellery, a half a pod of a garlic(chopped fine), a half cup of green onion tops, and a quarter cup of parsely are also chopped. These chopped ingredients are then mixed with the chunks of seasoned fish. This mixture is them placed into a pot big enough to hold it. We use a cast iron dutch oven, or, a big aluminum oval pot. that has two or three tablespoons of cooking oil coating the bottom. Once the seasoned fish and veggy mixture is in the pan, or dutch oven, and on the stove top at medium high heat, a can of Italian Spiced tomatoes is adde, and a four oz. can of tomatoe sause. Bring this mixture to a boil, and then turn the heat back to low low, and slow cook it till the veggies are cooked, and the fish is well done. This will take about 45 minutes. Do NOT Stir the pot. The pot should be shaken from side to side, not stirred. this will prevent the fish from sticking to the bottom. Cook down until the sauce is thick, and not a soup. We sometimes add two tablespoons of corn starch mixed with cold water, to thicken the sause if it is too thin. We serve this "Goo Sauce" over rice. Ted, thank you for your comment. It sounds like a very Louisiana type of recipe. I’d definitely be willing to give it a try, and maybe even update this article with the results… If I can talk dad into keeping some drum again.